Rector of Haworth Re. 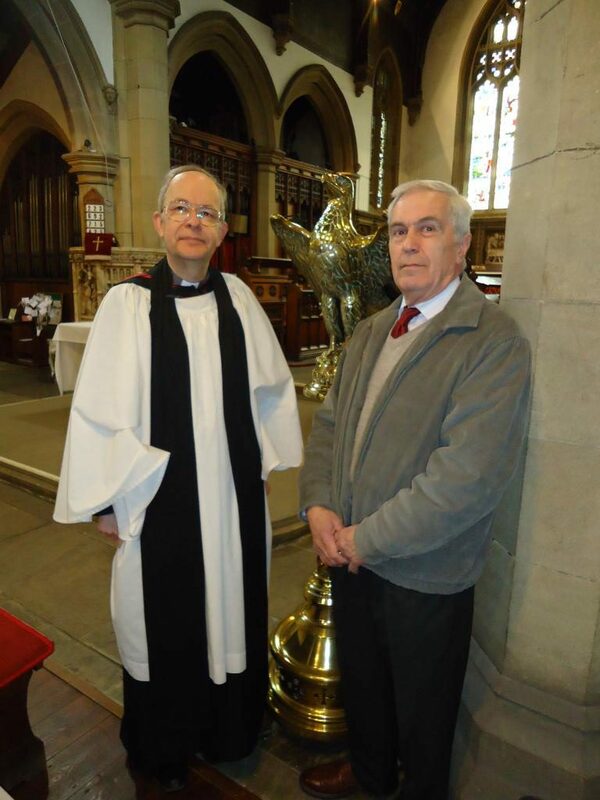 Peter Mullins (left) and Churchwarden Peter Breed (right) survey the work needed to improve the lighting. Just two years after completing a £600,000 restoration of its Victorian roof and spending more than £60,000 on a new central heating system, the Church was stunned to discover that the electrical system needed to be replaced. The grant will also help light up hidden features of St Michael’s, Haworth. Poor-lighting and accumulated grim have made spectacular nineteenth century murals difficult to see in this well-loved and heavily visited church. Now the shock of discovering that the whole building needs rewiring has led the congregation to develop a plan to enhance the building. During the last nine years £750,000 has been raised and spent to repair the church’s roofs and ensure both full access and proper toilet facilities for the disabled. The Allchurches Trust has now made this grant towards the new essential interior work. “We are hugely grateful to them for this significant contribution,” said Mr Mullins, “and to people like our Churchwarden Peter Breed and Treasurer Averil Kenyon have worked hard to ensure all the finances and permissions are in place to undertake the work later this year. “The Trust previously backed our roof restoration project and, without their generous support, it would be very difficult for us to undertake these major works. Allchurches Trust is one of the UK’s largest grant-making charities and gave a record £16.9 million to churches, charities and communities in 2018. Its funds come from its ownership of Ecclesiastical Insurance Group. Paul Playford, grants officer at Allchurches Trust, said: “This gem of a church in Haworth is of significant historical interest, having a special place in the hearts of literature lovers, as well as its local community. The Church community has been working since 2010 to restore the Church which is situated on Church Street, Haworth, and once the wiring and lighting work have been completed, several other projects are still to be undertaken, including the restoration the wall paintings.